More than ten years ago, I worked and lived for one full year in Japan, most exactly in the Aichi prefecture, close to Nagoya, in Toyota City. I wasn't a blogger at a time, and just gave up a career in journalism for the glamour of PR, but was not breaking completely with my media world and had the chance to share some of my thoughts in some weekly with a very selected and limited audience. For 12 months I was lucky enough to be connected with the best of the Japanese society and culture - and even seen the Emperor and the Emperess once as close as 2 meters. I did a lot of travels across the country, from Kyoto to the small villages where life seemed to stop couple of centuries back. However, despite my heart and eyes involvement in everything regarding Japan - add to the list a lot of literature my food experiences were, at least limited. I've been to a couple of traditional restaurants and started my long love affair with green tea - everything, less as tea but more cookies - and didn't have too much sushi, but my palate was in a very pre-primitive stage. I was simply missing the capacity of feeling and tasting and understanding the food, regardless it was from Japan, Spain or Morocco. A dramatic change that brought me closer to food - with capital F -, happened only in the last 7 years when I personally started to cook and bake intensively, my recipes becoming more elaborated from a meal to another. 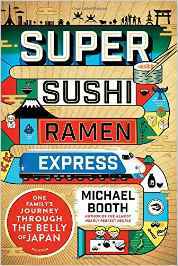 Therefore, most of the experiences shared by Michael Booth in its comprehensive journey through the Japanese culture were mostly foreign to me while I was living in Japan, but become relevant through my repeated foodie experiences in Europe or US or even the Middle East. But I don't have any unforgettable memories about the genuine Made in Japan food. It seems I missed a great deal about this country, as food is more than an opportunity to make you feel energized and well nourished; the plate you have in the front of you tells very often a lot of story about people and their world. With the curiosity of the anthropologist and an epicurious stomach, Michael Booth and his family are visiting the most interesting places in Japan, tasting iconic meals and ingredients and live to tell the story. Food is an episode of months-long journey where one will follow a sumo wrestler and the challenges faced by the sake industry, or the search for the secret of longevity - not clearly revealed. Food helps you better read a society, either you may arrive at a strange museum exhibiting the worms and other strange creatures found in foods. For Booth, food in Japan means 'texture, variation and contrast'. An interesting key that can be used more than once to read the society at large. On a different note, after reading this book, I can hardly accept to enter and taste some of the foods displayed as 'Japanese' in our old Europe. In the overwhelming majority of cases, it is nothing comparable with the 'original' Japanese food. A book recommended to anyone interested to better read Japan through food. As for me, I need to seriously plan a come back. PS. And stop eating sushi with chopsticks (not instead of fork and knife) Try it with your hands. Extra tip: wasabi and soy sauce mixed together is so....kitsch, you know. My brother is a big fan of Japan, so he knows a lot the culture and traditions.. It's his biggest dream to visit it one day, but for now, he just sticks with the food! He's a real Ramen-lover! And yes, we eat sushi with our hands!